Little House Home Arts: A Belated Happy Easter! Happy Passover! Happy Spring? A Belated Happy Easter! Happy Passover! Happy Spring? We are joking here in the East that Spring has come and gone. It was only a three day season this year. It is cold again, but the grass is greening slightly and the snow that came has left. Easter came, along with Passover, complete with sunshine and a bit of early spring! And I hope you all had a nice holiday gathered with friends, and family. 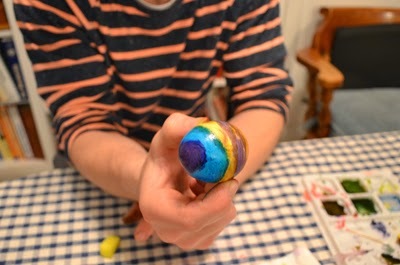 Our egg dying party was held in the nick of time. 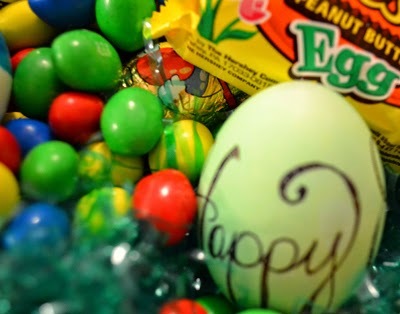 One of our annual guests suggested that if we couldn't coordinate our schedules to do it before Easter, he would be willing to come AFTER Easter! 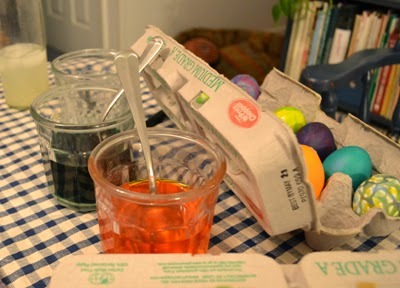 I was flattered that our egg dying party is an event he doesn't want to miss, but I did let him know that I am growing old and stuck in my ways and really like to dye eggs BEFORE Easter! It's true...flexibility isn't one of my better traits right now, though planning ahead is challenging for me as well! I went to my closet the day before Easter and again wondered what I would wear. I am always a bit relieved when it gets cold and I can wear a coat and not worry about the rest! We live in rural Vermont and I am afraid my sense of "dressing up" involves picking the right jacket and footwear only, and keeping warm and dry takes precidence over fashion! 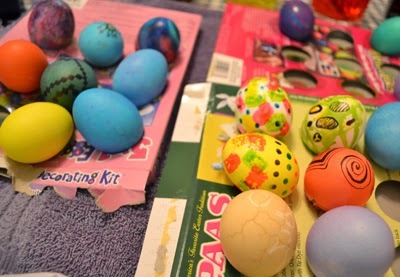 I will share a few pictures of the results of our egg dying party. 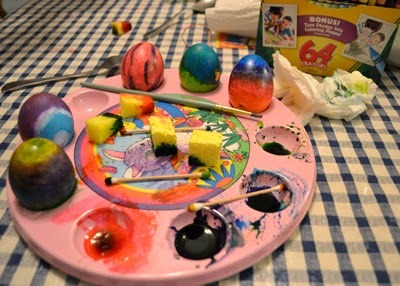 I am usually a spectator at this event more than a participant, but rolled up my sleeves this year and dyed my fingers as well as the eggs and so my pictures were an afterthought and but a few. I also am there to watch over those that need watching to be sure that it remains a safe event and that my white kitchen doesn't get dyed along with the eggs! Egg dying parties are not without risks! One year my husband mixed up his drink glass with one of his glasses of dye and acquired green teeth! I still laugh when I think back and remember a year in my childhood when my dad mixed up the hard-boiled eggs with raw ones, and cracking them that year was full of surprises! My dad had a great sense of humor and turned the event into a science experiment to see who could find the best way to differentiate between the two. I think it also became a lesson in math and I don't think the odds of being correct went above 50%. I am sure that my mother was relieved when the Easter eggs were gone that year! Another gathering of family and a time to appreciate that we again could come together to celebrate, though by the end of the weekend we then celebrated that the event was over. I learned long ago that "family vacations" is an oxymoron, and have added "family celebrations" to the list. We are richly blessed with personalities of all types! Though our family is few in number, I think we have it all and I am reminded of the line in the musical, "The Fantasticks" when they sing, "this plum is too ripe"...good to gather and nice to be back to peace and quiet! A belated Happy Easter, Happy Passover and Happy Spring from those of us at Little House! Would You Mend This for Me?